In the spring of 2015, I had recently met Rainbow Thunder Heart “Bavado”, an Eastern Shoshone Elder, at an event in LA. He had a Medicine Wheel on the floor, keep in mind there were hundreds of people at this event near LAX. He was talking about the Medicine Wheel & invited us to place our sacred items around the wheel. We quickly became friends & started working together at other gatherings. Shortly after this, I received a vision in dreamtime of a Mandala. When I awoke, I quickly drew it on paper. I knew it was powerful, but didn’t know what it was, or what to do with it. I called Bavado to describe this Mandala & sent him a copy of the drawing. He said that it was an Earth Grid, a very powerful grid. He started inviting me to work the Medicine Wheels with him, by placing the grid in the center & building the rest of the Medicine wheel around it. 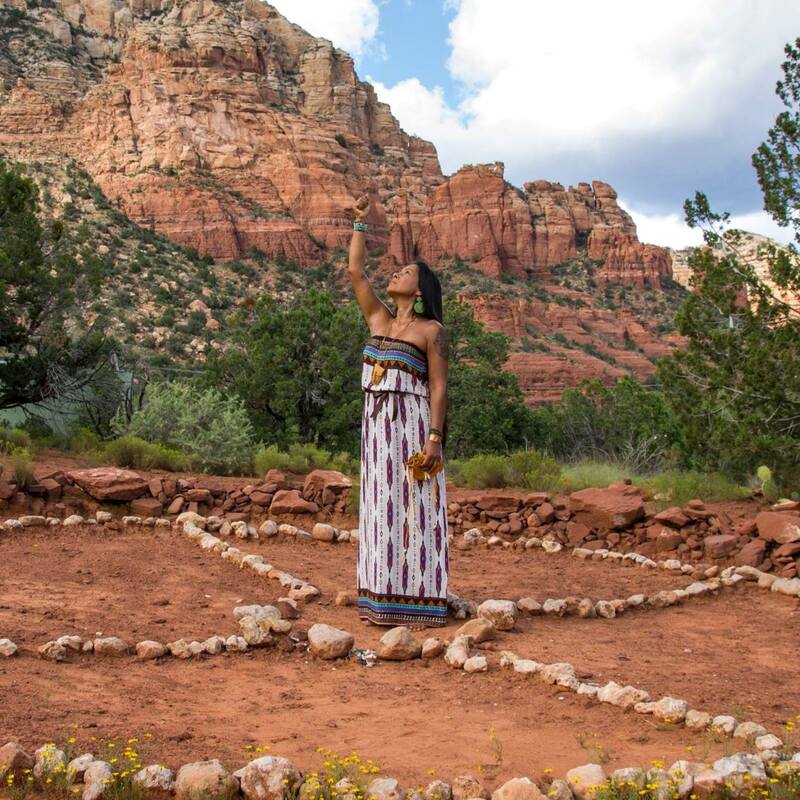 Medicine Wheels can be utilized in different ways, such as creating balance within an area, heal Earth’s sacred sites. Sacred sites are charging stations, charging the Earth with electrical current. Two energies are spinning, one to the left & one to the right.. The energy that gives power to these is in the center, the creator energy, where the vortex spins. When you put into the spinning energy, the thought, the prayer, intention or word, comes into being. Bavado has recently crossed over into the Spirit world & has been working very diligently, letting us know that it’s time for us to continue his work. Before my work here in Sedona ended, I checked in with Spirit to ask if this is my calling, my next assignment & received a big confirmation. We can create Medicine wheels to anchor in the energies for great health, love, honor, trust, respect, and integrity for Nature’s benefit and the benefit of Humanity in all our emotions, thoughts, actions and words.